The Rus' Khaganate is the name applied by some modern historians to a hypothetical polity postulated to exist during a poorly documented period in the history of Eastern Europe, roughly the late 8th and early-to-mid-9th centuries AD. It was suggested that the Rus' Khaganate was a state, or a cluster of city-states, set up by a people called Rus', described in all contemporary sources as being Norsemen, somewhere in what is today European Russia, as a chronological predecessor to the Rurik Dynasty and Kievan Rus'. The region's population at that time was composed of Slavic, Finno-Ugric, Turkic, Baltic, Finnic, Hungarian and Norse peoples. The region was also a place of operations for Varangians, eastern Scandinavian adventurers, merchants, and pirates. In sparse contemporaneous sources, the leader or leaders of Rus people at this time were referred to by the Old Turkic title Khagan, hence the suggested name of their polity. This period is thought to be the times of the genesis of a distinct Rus' ethnos, which gave rise to Kievan Rus' and later states from which modern Russia, Belarus, and Ukraine evolved. 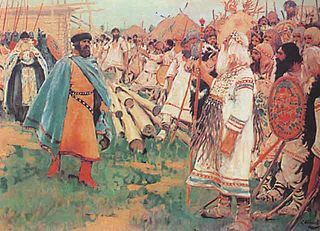 The title of "khagan" for a leader of some groups of Rus' people is mentioned in several historical sources, most of them foreign texts dating from the 9th century, while three East Slavic sources date from the 11th and 12th centuries. The earliest European reference related to the Rus' people ruled by a khagan comes from the Frankish Annals of St. Bertin, which refer to a group of Norsemen who called themselves Rhos (qui se, id est gentem suam, Rhos vocari dicebant) and visited Constantinople around 838. Fearful of returning home via the steppes, which would leave them vulnerable to attacks by the Magyars, these Rhos travelled through the Frankish Empire accompanied by Greek ambassadors from the Byzantine emperor Theophilus. When questioned by the Frankish Emperor Louis the Pious at Ingelheim, they stated that their leader was known as chacanus (hypothesized to be either the Latin word for "Khagan" or a deformation of Scandinavian proper name Håkan), that they lived far to the north, and that they were Swedes (comperit eos gentis esse sueonum). Thirty years later, in spring 871, the eastern and western emperors, Basil I and Louis II, quarreled over control of Bari, which had been conquered from the Arabs by their joint forces. The Byzantine emperor sent an angry letter to his western counterpart, reprimanding him for usurping the title of emperor. He argued that the Frankish rulers are simple reges, while the imperial title properly applied only to the overlord of the Romans, that is, to Basil himself. He also pointed out that each nation has its own title for the supreme ruler: for instance, the title of chaganus is used by the overlords of the Avars, Khazars (Gazari), and "Northmen" (Nortmanno). To that, Louis replied that he was aware only of the Avar khagans, and had never heard of the khagans of the Khazars and Normans. The content of Basil's letter, now lost, is reconstructed from Louis's reply, quoted in full in the Salerno Chronicle, and it indicates that at least one group of Scandinavians had a ruler who called himself "khagan". Ahmad ibn Rustah, a 10th-century Muslim geographer from Persia, wrote that the Rus' khagan ("khāqān rus") lived on an island in a lake. Constantine Zuckerman comments that Ibn Rustah, using the text of an anonymous account from the 870s, attempted to accurately convey the titles of all rulers described by its author, which makes his evidence all the more precious. Ibn Rustah mentions only two khagans in his treatise — those of Khazaria and Rus. A further near-contemporary reference to the Rus' comes from al-Yaqubi, who wrote in 889 or 890 that the Caucasus mountaineers, when besieged by the Arabs in 854, asked for help from the overlords (sahib) of al-Rum (Byzantium), Khazaria, and al-Saqaliba (Slavs). According to Zuckerman, Ibn Khordadbeh and other Arab authors often confused the terms Rus and Saqaliba when describing their raids to the Caspian Sea in the 9th and 10th centuries. But n.b., Ibn Khordādbeh's Book of Roads and Kingdoms does not mention the title of Khagan for the ruler of Rus'. Hudud al-Alam, an anonymous Persian geography text written in the late 10th century, refers to the Rus' king as "Khāqān-i Rus". As the unknown author of Hudud al-Alam relied on numerous 9th-century sources, including Ibn Khordādbeh, it is possible that his reference to the Rus' Khagan was copied from earlier, pre-Rurikid texts, rather than reflecting contemporary political reality. Finally, the 11th century Persian geographer Abu Said Gardizi mentioned "khāqān-i rus" in his work Zayn al-Akhbār. Like other Muslim geographers, Gardizi relied on traditions stemming from the 9th century. Extant primary sources make it plausible that the title of khagan was applied to the rulers of the Rus' during a rather short period, roughly between their embassy to Constantinople (838) and Basil I's letter (871). All Byzantine sources after Basil I refer to the Rus' rulers as archons (Greek for "ruler"). The dating of the Khaganate's existence has been the subject of debates among scholars and remains unclear. Paul Robert Magocsi and Omeljan Pritsak date the foundation of the Khaganate to be around the year 830. According to Magocsi, "A violent civil war took place during the 820s with "The losers of the internal political struggle, known as Kabars, fled northward to the Varangian Rus' in the upper Volga region, near Rostov, and southward to the Magyars, who formerly had been loyal vassals of the Khazars. The presence of Kabar political refugees from Khazaria among the Varangian traders in Rostov helped to raise the latter's prestige, with the consequence that by the 830s a new power center known as the Rus' Kaganate had come into existence." Whatever the accuracy of such estimates may be, there are no primary sources mentioning the Rus' or its khagans prior to the 830s. Omeljan Pritsak noted that the leader of those Kabars was Khan-Tuvan. Equally contentious has been the discussion about the date of the khaganate's disintegration. The title of Khagan is not mentioned in the Rus'-Byzantine treaties (907, 911, 944), or in De Ceremoniis, a record of court ceremonials meticulously documenting the titles of foreign rulers, when it deals with Olga's reception at the court of Constantine VII in 945. Moreover, ibn Fadlan, in his detailed account of the Rus (922), designated their supreme ruler as malik ("king"). From this fact, Peter Golden concluded via an argumentum ex silentio that the khaganate collapsed at some point between 871 and 922. Zuckerman, meanwhile, argues that the absence of the title "khagan" from the first Russo-Byzantine Treaty proves that the khaganate had vanished by 911. The location of the khaganate has been actively disputed since the early 20th century. According to one fringe theory, the Rus' khagan resided somewhere in Scandinavia or even as far west as Walcheren. In stark contrast, George Vernadsky believed that the khagan had his headquarters in the eastern part of the Crimea or in the Taman Peninsula and that the island described by Ibn Rustah was most likely situated in the estuary of the Kuban River. Neither of these theories has won many adherents, as archaeologists have uncovered no traces of a Slavic-Norse settlement in the Crimea region in the 9th century and there are no Norse sources documenting "khagans" in Scandinavia. Soviet historiography, as represented by Boris Rybakov and Lev Gumilev, advanced Kiev as the residence of the khagan, assuming that Askold and Dir were the only khagans recorded by name. Mikhail Artamonov became an adherent of the theory that Kiev was the seat of the Rus' Khaganate, and continued to hold this view into the 1990s. Western historians, however, have generally argued against this theory. There is no evidence of a Norse presence in Kiev prior to the 10th century. Troublesome is the absence of hoards of coins which would prove that the Dnieper trade route — the backbone of later Kievan Rus' — was operating in the 9th century. Based on his examination of the archaeological evidence, Zuckerman concludes that Kiev originated as a fortress on the Khazar border with Levedia and that only after the Magyars departed for the west in 889 did the middle Dnieper region start to progress economically. A number of historians, the first of whom was Vasily Bartold, have advocated a more northerly position for the khaganate. They have tended to emphasize ibn Rustah's report as the only historical clue to the location of the khagan's residence. Recent archaeological research, conducted by Anatoly Kirpichnikov and Dmitry Machinsky, has raised the possibility that this polity was based on a group of settlements along the Volkhov River, including Ladoga, Lyubsha, Duboviki, Alaborg, and Holmgard. "Most of these were initially small sites, probably not much more than stations for re-fitting and resupply, providing an opportunity for exchange and the redistribution of items passing along the river and caravan routes". 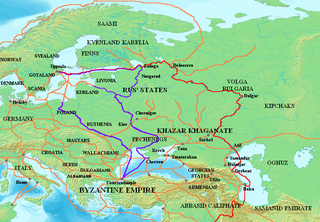 If the anonymous traveller quoted by ibn Rustah is to be believed, the Rus of the Khaganate period made extensive use of the Volga route to trade with the Middle East, possibly through Bulgar and Khazar intermediaries. His description of the Rus' island suggests that their center was at Holmgard, an early medieval precursor of Novgorod whose name translates from Old Norse as "the river-island castle". The First Novgorod Chronicle describes unrest in Novgorod before Rurik was invited to come to rule the region in the 860s. This account prompted Johannes Brøndsted to assert that Holmgard-Novgorod was the khaganate's capital for several decades prior to the appearance of Rurik, including the time of the Byzantine embassy in 839. Machinsky accepts this theory but notes that, before the rise of Holmgard-Novgorod, the chief political and economic centre of the area was located at Aldeigja-Ladoga. The origins of the Rus' Khaganate are unclear. The first Norse settlers of the region arrived in the lower basin of the Volkhov River in the mid-8th century. The country comprising the present-day Saint-Petersburg, Novgorod, Tver, Yaroslavl, and Smolensk regions became known in Old Norse sources as "Garðaríki", the land of forts. Around the 860 Rus', a group of Vikings perhaps from Roden, Sweden, began to rule the area under their leader Rurik. Gradually, Norse warlords, known to the Turkic-speaking steppe peoples as "köl-beki" or "lake-princes", came to dominate some of the region's Finno-Ugric and Slavic peoples, particularly along the Volga trade route linking the Baltic Sea with the Caspian Sea and Serkland. 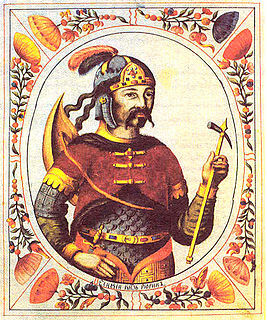 Omeljan Pritsak speculated that a Khazar khagan named Khan-Tuvan Dyggvi, exiled after losing a civil war, settled with his followers in the Norse-Slavic settlement of Rostov, married into the local Scandinavian nobility, and fathered the dynasty of the Rus' khagans. Zuckerman dismisses Pritsak's theory as untenable speculation, and no record of any Khazar khagan fleeing to find refuge among the Rus' exists in contemporaneous sources. Nevertheless, the possible Khazar connection to early Rus' monarchs is supported by the use of a stylized trident tamga, or seal, by later Rus' rulers such as Sviatoslav I of Kiev; similar tamgas are found in ruins that are definitively Khazar in origin. The genealogical connection between the 9th-century Khagans of Rus' and the later Rurikid rulers, if any, is unknown at this time. Most historians agree that the title "khagan" was borrowed by the Rus from the Khazars, but there is considerable dispute over the circumstances of this borrowing. Peter Benjamin Golden presumes that the Rus' Khaganate was a puppet state set up by the Khazars in the basin of the Oka River to fend off recurring attacks of the Magyars. However, no source records that the Rus' of the 9th century were subjects of the Khazars. For foreign observers (such as Ibn Rustah), there was no material difference between the titles of the Khazar and Rus' rulers. Anatoly Novoseltsev hypothesizes that the adoption of the title "khagan" was designed to advertise the Rus' claims to the equality with the Khazars. This theory is echoed by Thomas Noonan, who asserts that the Rus' leaders were loosely unified under the rule of one of the "sea-kings" in the early 9th century, and that this "High King" adopted the title "khagan" to give him legitimacy in the eyes of his subjects and neighboring states. According to this theory, the title was a sign that the bearers ruled under a divine mandate. Writing in 922, Ibn Fadlan described the Rus' ruler as having little real authority like the Khazar khagan). Instead, political and military power was wielded by a deputy, who "commands the troops, attacks [the Rus' ruler's] enemies, and acts as his representative before his subjects." The supreme king of the Rus', on the other hand, "has no duties other than to make love to his slave girls, drink, and give himself up to pleasure." He was guarded by 400 men, "willing to die for him ... These 400 sit below the royal throne: a large and bejewelled platform which also accommodates the forty slave-girls of his harem." Ibn Fadlan wrote that the Rus' ruler would almost never leave his throne and even "when he wants to go riding his horse is led up to him, and on his return the horse is brought right up to the throne." Ibn Rustah, on the other hand, reported that the khagan was the ultimate authority in settling disputes between his subjects. His decisions, however, were not binding, so that if one of the disputants disagreed with the khagan's ruling, the dispute was then resolved in a battle, which took place "in the presence of the contestants' kin who stand with swords drawn; and the man who gets the better of the duel also gets the decision about the matter in dispute." The dichotomy between the relative powerlessness of the nominal ruler and the great authority of his subordinate reflects the structure of Khazar government, with secular authority in the hands of a Khagan Bek only theoretically subordinate to the khagan, and it agrees with the traditional Germanic system, where there could be a division between the king and the military commander. Moreover, some scholars have noted similarities between this dual kingship and the postulated relationship between Igor and Oleg of Kiev in the early 10th century (compare Askold and Dir in the 9th century). The institution of separate sacral ruler and military commander may be observed in the reconstructed relationship between Oleg and Igor, but whether this is part of the Rus' Khaganate's legacy to its successor-state is unknown. The early Kievan Rus' principalities exhibited certain distinctive characteristics in their government, military organization, and jurisprudence that were comparable to those in force among the Khazars and other steppe peoples; some historians believe that these elements came to Kievan Rus' from the Khazars by way of the earlier Rus' Khagans. Soon after Patriarch Photius informed other Orthodox bishops about the Christianization of the Rus, all major settlements in North-Western Russia which could have been centres of the khaganate were destroyed by fire. Archaeologists found convincing evidence that Holmgard, Aldeigja, Alaborg, Izborsk were burnt to the ground in the 860s or 870s. Some of these settlements were permanently abandoned after the conflagration. The Primary Chronicle describes the uprising of the pagan Slavs and Chudes (Finnic peoples) against the Varangians, who had to withdraw overseas in 862. The First Novgorod Chronicle, whose account of the events Shakhmatov considered more trustworthy, does not pinpoint the pre-Rurikid uprising to any specific date. The 16th century Nikon Chronicle attributes the banishment of the Varangians from the country to Vadim the Bold. The Ukrainian historian Mykhailo Braichevsky labelled Vadim's rebellion "a pagan reaction" against the Christianization of the Rus'. A period of unrest and anarchy followed, dated by Zuckerman to ca. 875–900. The absence of coin hoards from the 880s and 890s suggests that the Volga trade route ceased functioning, precipitating "the first silver crisis in Europe". After this economic depression and period of political upheaval, the region experienced a resurgence beginning in around 900. Zuckerman associates this recovery with the arrival of Rurik and his men, who turned their attention from the Volga to the Dnieper, for reasons as yet uncertain. The Scandinavian settlements in Ladoga and Novgorod revived and started to grow rapidly. During the first decade of the 10th century, a large trade outpost was formed on the Dnieper in Gnezdovo, near modern Smolensk. Another Dnieper settlement, Kiev, developed into an important urban centre roughly in the same period. Annales Bertiniani, a. 839, (The Annals of St. Bertin). Ed. Georg Waitz, Monumenta Germaniae Historica, Scriptores rerum Germanicarum in usum scholarum. Hannoverae, 1883. pp. 19–20. Callmer J. The Archaeology of Kiev to the End of the Earliest Urban Phase. // Harvard Ukrainian Studies, 1987, No.11. Franklin, Simon and Jonathan Shepard. The Emergence of Rus 750–1200. London: Longman, 1996. ISBN 0-582-49091-X. Garipzanov, Ildar. The Annals of St. Bertin and the Chacanus of the Rhos. University of Bergen, 2006. Kovalev, Roman. "What Does Historical Numismatics Suggest about the Monetary History of Khazaria in the Ninth Century?- Question Revisited." Archivum Eurasiae Medii Aevi 13(2004):97–129. Laurent, J. and M. Canard. L'Armenie entre Byzance et l'Islam depuis la conquete arabe jusqu'en 886. Lisbon, 1980. Noonan, Thomas. "The Khazar Qaghanate and Its Impact On the Early Rus' State: The translatio imperii from Itil to Kiev." Nomads in the Sedentary World, Anatoly Mikhailovich Khazanov and Andre Wink, eds. p. 76–102. Richmond, England: Curzon, 2001. ISBN 0-7007-1370-0. Noonan, Thomas. "When Did Rus/Rus' Merchants First Visit Khazaria and Baghdad?" Archivum Eurasiae Medii Aevi 7 (1987–1991): 213–219. Noonan, Thomas. "The First Major Silver Crisis in Russia and the Baltic, ca. 875–900". Hikuin, 11 (1985): 41–50. Новосельцев А.П. "К вопросу об одном из древнейших титулов русского князя". [On One of the Oldest Titles of the Rus' Princes]. История СССР. – 1982. – Вып. 4. Zuckerman, Constantine. "Deux étapes de la formation de l'ancien état russe", in Les centres proto-urbains russes entre Scandinavie, Byzance et Orient: Actes du Colloque International tenu au Collège de France en octobre 1997, éd. M. Kazanski, A. Nersessian et C. Zuckerman (Réalités Byzantines 7). Paris, 2000 (Russian translation online). Zuckerman, Constantine. "Les Hongrois au Pays de Lebedia: une nouvelle puissance aux confins de Byzance et de la Khazarie en 836–889." Byzantium at War (9th–12th c.) Athens, 1997. Online Britannica on Russia: Prehistory and the rise of the Rus. Pritsak on the Origins of the Rus'. Rus' in the Hudud al-Alam. ^ a b c ""A violent civil war took place during the 820s [...] The losers of the internal political struggle, known as Kabars, fled northward to the Varangian Rus' in the upper Volga region, near Rostov, and southward to the Magyars, who formerly had been loyal vassals of the Khazars. The presence of Kabar political refugees from Khazaria among the Varangian traders in Rostov helped to raise the latter's prestige, with the consequence that by the 830s a new power center known as the Rus' Kaganate had come into existence." Magocsi, Paul Robert (2010). A History of Ukraine: A Land and Its Peoples. Toronto: University of Toronto Press. p. 62. ^ "By the end of the 9th century, Helgi/Oleh the empire builder [...] had from his capital in Kiev gained control over most of the East Slavic tribes [to] the upper Volga in the far north." Magocsi, Paul Robert (2010). A History of Ukraine: A Land and Its Peoples. Toronto: University of Toronto Press. p. 66. ^ a b Franklin, Simon and Jonathan Shepard. The Emergence of Rus 750–1200. London: Longman, 1996. ISBN 0-582-49091-X. pp. 33–36. ^ a b Dolukhanov, P.M. The Early Slavs: Eastern Europe and the Initial Settlement to Kievan Rus'. London: Longman, 1996. p. 187. ^ A minority of scholars believe that the reference was to a king bearing the Old Norse name Håkan or Haakon. See, e.g., Garipzanov 8–11. ^ Annales Bertiniani, a. 839, (The Annals of St. Bertin). Ed. Georg Waitz, Monumenta Germaniae Historica, Scriptores rerum Germanicarum in usum scholarum. Hannoverae, 1883. pp. 19–20; Jones, Gwyn. A History of the Vikings. 2nd ed. London: Oxford Univ. Press, 1984. pp. 249-50. ^ cagano veram non praelatum Avarum, non Gazanorum aut Nortmannorum nuncipari reperimus. Duczko 25. ^ Dolger T. 59, №487. ^ Brøndsted (1965), pp. 267–268. ^ a b Zuckerman, "Deux étapes" 96. ^ Laurent and Canard 490. ^ See, e.g., Minorsky xvi. ^ "Rus", Encyclopaedia of Islam. ^ a b Pritsak, Origin of Rus', passim. ^ a b Pritsak, Origins of Rus' 1:28, 171, 182. ^ Franklin and Shepard 27–50. ^ From the Baltic to the Black Sea: Studies in Medieval Archaeology (One World Archaeology, 18) by David Austin Publisher: Routledge; New edition (June 27, 1997).pp. 285–286; Э. Мюле. К вопросу о начале Киева// Вопросы истории. – № 4 – 1989 – с. 118 – 127. ^ Yanin 105–106; Noonan, The Monetary System of Kiev 396. ^ Zuckerman, "Les Hongrois au Pays de Lebedia" 65–66. ^ Zuckerman, 2000; Мачинский 5–25. ^ A Comparative Study of Thirty City-state Cultures 266. ^ Brøndsted 67–68; for a detailed analysis of recent archaeological investigations at Holmgard, see Duczko 102–104. ^ Мачинский 5–25; see also Duczko 31–32. ^ "Online Etymology Dictionary". Etymonline.com. Retrieved 2012-08-15. ^ "Rus – definition of Rus by the Free Online Dictionary, Thesaurus and Encyclopedia". Thefreedictionary.com. Retrieved 2012-08-15. ^ Archaeologists did not find traces of a settlement in Rostov prior to the 970s. Furthermore, the placename "Rostov" has a transparent Slavic etymology. ^ Brook 154; Franklin and Shepard 120–121; Pritsak, Weights 78–79. ^ But see, e.g., Duczko 31–32, outlining theories that Rurik held the title of Khagan Rus'. ^ Golden 77–99; Duczko 30. ^ Noonan, "Khazar" 87–89, 94. ^ Brook 154; Noonan, "Khazar" 87–94. ^ a b Christian 340–341, citing ibn Fadlan's Risala. ^ Franklin and Shepard, 91–111. ^ See, e.g., Duczko 81 et seq., discussing the argument among various scholars as to whether the devastating attacks of the 860s and 870s were caused by Rurik and a new wave of Norse settlers who supplanted the old Rus Khagans, whether the burnings of the Rus' settlements were the result of civil war unconnected to Rurik's purported ascendency, or whether they were caused by unrelated incursions by Norsemen or other people. ^ Franklin and Shepard, 53. The Khazars were a semi-nomadic Turkic people with a confederation of Turkic-speaking tribes that in the late 6th century CE established a major commercial empire covering the southeastern section of modern European Russia. The Khazars created what for its duration was the most powerful polity to emerge from the break-up of the Western Turkic Khaganate. Astride a major artery of commerce between Eastern Europe and Southwestern Asia, Khazaria became one of the foremost trading emporia of the medieval world, commanding the western marches of the Silk Road and playing a key commercial role as a crossroad between China, the Middle East and Kievan Rus'. For some three centuries the Khazars dominated the vast area extending from the Volga-Don steppes to the eastern Crimea and the northern Caucasus. Sarkel was a large limestone-and-brick fortress in the present-day Rostov Oblast of Russia, on the left bank of the lower Don River.